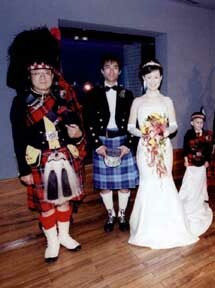 Sin-Cos offers-pipers and drummers for Weddings. Nothing is more stunning than to have the Bride led into church by a piper, to have the couple enter the hall behind a piper and drummer who lead them to the top table, wait until they are seated and then march of playing. What an entrance! Is your Boss arriving from overseas? Have him met a piper. Have him piped from his car into the office/hotel. Have him piped into the Board room. What prestige! Is the Queen coming? In that case you need the whole pipeband.